CalDigit is Giving Away 10 Free CalDigit VRs in January!!! 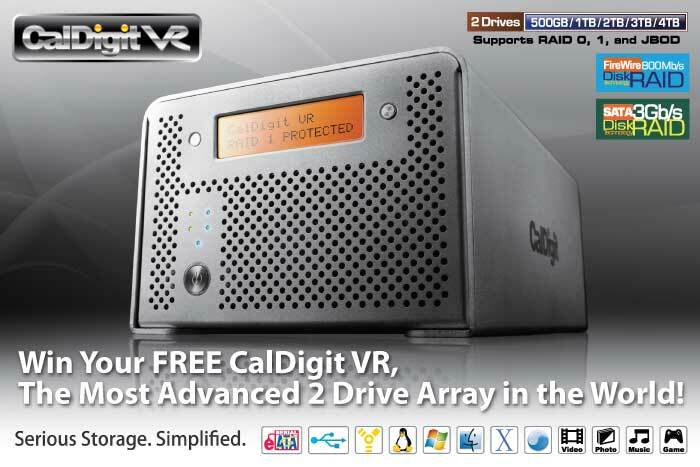 The CalDigit VR is the most advanced 2 drive array on the market. It can be used for everything from video editing to a simple yet powerful backup solution. It has advanced features to make sure you know the status of your storage, and the included software supports email notification. During January you can sign up to win 1 of 10 of these drives. Stop by the CalDigit booth (N 3527) at Macworld and enter to win 1 of 10 FREE CalDigit VRs in the giveaway! If you will not be attending Macworld sign up online. The CalDigit VR is the the most advanced two drive RAID system in it’s class, supporting a quadruple interface for easy connectivity (Firewire 400/800, USB 2.0, and eSATA). There is no performance loss when daisy chaining the CalDigit VR using Firewire 800. The CalDigit VR’s modular design provides two hot swappable drive modules and an easy to read front LCD. With support for RAID 0, 1, and JBOD the CalDigit VR can reach speeds of up to 220MB/s, and includes a easy to use GUI for configuration and monitoring which supports email notification. The CalDigit VR packs a ton of performance into a small package, making it a truly portable solution.